Points Needed: 14700 Games are not compatible with mobile and tablet devices. Please add this title to your Wish List and sign on to your the first club account from a desktop computer to complete your redemption. NOTICE: Activation key must be used on a valid Steam account. Requires an internet connection. Ultimate EditionThis game includes : Sins of a Solar Empire®: Rebellion Sins of a Solar Empire®: Rebellion - Original Soundtrack, Sins of a Solar Empire®: Rebellion - Forbidden Worlds™ DLC Sins of a Solar Empire®: Rebellion - Stellar Phenomena® About the game	The Next Install… ment to the Award-Winning RTS. While many were hopeful that diplomacy would finally end the war, differing opinions on what should be done, along with the depleted power of the controlling factions, has led to a splintering of the groups involved.The loyalist members of the Trader Emergency Coalition adopt a policy of isolation, focusing on enhanced defenses to ride out the rest of the war. Those who rebel against the coalition take on a purely militant view, coming to the opinion that the only way to bring peace is by ultimately crushing all who oppose them - especially xenos.For the first time in their history, the war creates a schism in the Advent Unity. The loyalists seek to continue their policy of revenge against the Traders, and to assimilate all others to the Unity’s influence. However, others amongst the Advent suspect that a corrupting influence from within has diverted the Unity from its proper destiny.The divide created in the Vasari Empire is less pronounced, but just as severe to their people. With the Vasari now practically frantic to move on to new space, the loyalist faction abandons cooperation and decides to take the resources they need by any means necessary. Having accepted the need to work together, the rebel faction feels that their best chance for survival is to work with the other races and bring them along to flee the approaching enemy.Take the battle for galactic supremacy to its ultimate level in Sins of a Solar Empire: Rebellion – a standalone RT4X game that combines the tactics of real-time strategy with the depth of the 4X genre (eXplore, eXpand, eXploit, eXterminate). Key features New Factions: Decide whether to play as a Loyalist or Rebel – each unlocks new technologies, ships and play styles for each race. New Titan Class Warships: Mighty titans enter the fray of the war to tip the scales of power. Each faction may field their own unique titan, drawing upon unique strengths and abilities on the battlefield. New and Updated Capital Ships: A new capital ship joins the fleet for each race to offer even more tactical options. Additionally, all existing capital ships have been upgraded to four levels for their abilities, allowing players to focus their ships along specific strengths. New Corvette Class Ships: Small and maneuverable, each faction has developed a new light attack craft to harass enemy forces. Updated Visuals: Updated graphics, particle effects, lighting and shadows, race specific UI and other enhancements make the Sins’ universe look better than ever. New Victory Conditions: Take multiple paths to victory including – Military, Diplomatic, Research, Last Flagship Standing, Last Capital Standing and Occupation. New Audio: More than 60 minutes of original music, countless new sound effects and dozens of new voice overs help bring the drama of battle to new levels of immersion. Tutorials: New and updated tutorials make it easy for both experienced and new players to quickly start building their own solar empire. Plus, a number of optimizations that provide better performance than ever before! system requirements Windows - Minimum OS: Windows 10 / 8 / Windows 7 SP1 / Windows Vista SP2 Processor: 3 GHz Intel Pentium 4 Processor or Equivalent Graphics card: 256 MB Video Card w/Pixel Shader 3.0 Support (Radeon X1650 / GeForce 6800* or Better) Sound Card: DirectX Compatible Sound Card Keyboard and Mouse (w/scroll wheel)	* NVidia video chipsets must use driver version 296.10 or higher and mobile cards be set as the primary video chipset for the game.Windows - RecommendedProcessor: Intel Core i5/i7 Processor or Equivalent, 3 GHz Intel Quad-Core Processor / 3.2 GHz AMD Six-Core ProcessorGraphics card: 1 GB Video Card w/Pixel Shader 3.0 Support (Radeon X3000 Series / GeForce 8000* Series or Better)Sound Card: DirectX Compatible Sound Card	©2012 Stardock Entertainment and Ironclad Games Corporation. 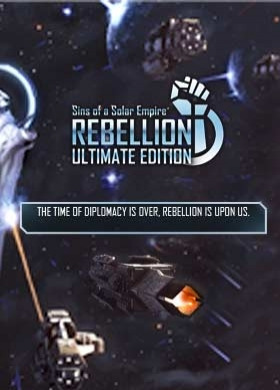 Sins of a Solar Empire and Sins of a Solar Empire: Rebellion are registered trademarks of Ironclad Games Corporation. All rights reserved.